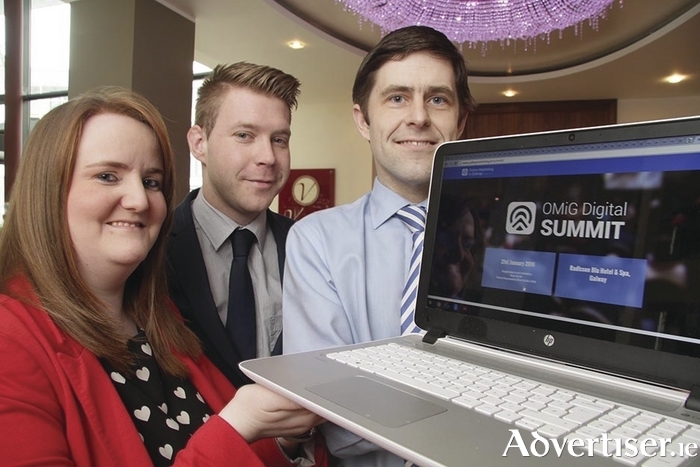 Maricka Burke Keogh, OMiG founder, and David Glynn, co-creator of the OMiG Digital Summit, with Kenneth Kelly (centre) of the Galway Advertiser, event media partner. Photo: Mike Shaughnessy. This afternoon (Thursday ) will see Galway’s biggest marketing event get under way in the Radisson Blu Hotel. Online Marketing in Galway’s Digital Summit is bringing experts from the fields of content marketing, analytics, and social media marketing to the city for an evening of insights and information. According to David Glynn of Online Marketing in Galway (OMiG ), today’s event is the culmination of a year’s planning which began after last year’s Digital Summit. This year’s OMiG Digital Summit features a bigger venue, the event has been redesigned based on feedback from last year’s summit, and the organisers have put together a stellar list of speakers from some of the country’s top companies. Today’s event will mark the first time representatives of Google and Twitter have spoken in Galway, while other companies represented at the summit include The Guardian, Aer Lingus, and Galway-based analytics provider Altocloud. OMiG was founded in 2011 by ex-Googler Maricka Burke Keogh, who saw the need for organised networking in Galway in the then emerging discipline of digital marketing. The group, which is entirely voluntary, began running monthly marketing seminars in Galway, attracting representatives from companies such as Marketo, Joe.ie, Paddy Power, Ryanair, and The Irish Times to speak in the city. Through these monthly seminars they found the appetite for new information was huge. The Digital Summit will get under way with registration from 3pm in the Radisson Blu Hotel today, with the first of three panels of speakers beginning at 4pm. In the first session, Aaron Chalke, digital media manager with Media Works; Natalie Roper, The Guardian’s digital engagement marketing manager; and Grainne Redmond, head of digital sales at Eir, will discuss how their companies have used content marketing to grow their audiences. Later in the day, a panel focusing on data analytics for marketers will feature Lillian Gallagher, head of data and analytics at Dublin-based creative brand agency In the Company of Huskies; and Maciej Dabrowski, chief data scientist at Altocloud; along with Aislinn Connolly, brand development manager at Google, who will discuss how to make the best use of Google Analytics to inform marketing decisions. The third panel of the evening, on social media marketing, will hear from Sinead Conway, sales manager with Twitter; Mark Brennan, Allied Irish Bank’s head of digital marketing and innovation; and Paul Buckley, head of social media at Aer Lingus. Each panel session will include discussion and audience questions, and the summit will be followed by a jazz party, also in the Radisson Blu Hotel. By featuring top speakers in key marketing disciplines the organisers are aiming to ensure the OMiG Digital Summit is on a par with larger events in the capital. Galway has grown to become a key location for Ireland’s technology sector, and with a well established medtech industry locally and a growing number of tech startups, as well as burgeoning food, hospitality, and culture sectors, the city is fast becoming a national hub for all things digital. Indeed several of this evening’s speakers — namely Aislinn Connolly, Sinead Conway, Paul Buckley, and Lillian Gallagher — are Galwegians. “Now they’re coming home to share their knowledge and success stories,” Mr Glynn said of the Galway speakers. The OMiG Digital Summit is organised by a team of volunteers, and all proceeds from the event will go towards the cost of running it. Mr Glynn said the event would not be possible without the support of OMiG’s sponsors and partners. The event has been made possible by the support of platinum sponsor Ireland West Airport, gold sponsor Blacknight, and silver sponsor IMS Technical Marketing Solutions. Event partners are the Galway Advertiser, Cantec, Altocloud, and event producers Bentley Productions. Page generated in 0.2017 seconds.